Little Red Riding Hood never wore red, she wore grey. Roses are light black, lemons are dark white; and Italy, Ireland, and France share the same flag. A glass of orange juice is a glass of grey juice. Blood and petrol look the same. I live in a black and white world. I am completely colourblind. I am achromatopsic. I am also a painter. Neil Harbisson is a man who always viewed life in black and white, he has achromatopsia, a condition which means he is unable to see colours. Using a custom-made device called an ‘eyeborg’, Harbisson can translate hues into sound frequencies, he can hear colour. A scale of musical tones represents the spectrum of colours – light hues are high-pitched, while darker colours sound bolder. It is like a hearing colour wheel. Where we see the sky as blue, Harbisson hears it as C sharp. When he first got the device Harbisson often spent an hour in the fruit or flower section of a supermarket – just so he could experience for the first time the sound of the vibrant colours. Harbisson now hears colours when listening to music. A female performer at a concert sang in shades of yellow while the whirr of his Hoover is red. The combination of sound and music offers intriguing possibilities. Before this Harbisson used to rely on other people’s perception of colours. They used to tell him that cities were grey and drab, so Harbisson decided to prove them wrong. He and fellow artist and performer, Moon Ribas, embarked on a project looking for the colour that defines each capital city in Europe. 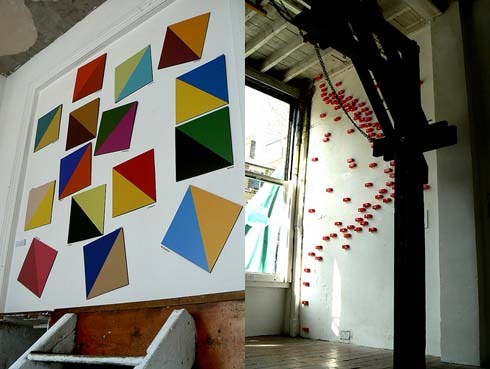 Each city was represented as a square made up of two triangles of different colour. In Monaco, it was azure and salmon pink; in Bratislava it was yellow and turquoise; and in Andorra it was dark green and fuchsia. As a brand agency, we spend much of our lives speaking in visual language, I myself am something of a connoisseur of colour. We’ve always understood the importance of colour to cultures as well as to brands. From a brand design perspective, owning a colour in your market can provide an enormous competitive advantage, make your brand instantly recognizable, and provide a strong sense of brand personality. But Harbisson’s work gave us pause to consider the greater role that colour plays in our lives – the deeper connections we feel culturally, socially and even perhaps aurally. If you’d like to talk to us about finding the right colour and other visual language for your brand, why not give us a call. Cassandra, I really like this article. I’d love to meet this guy. AS a marketer I have always been sold on the important role color plays for my brand image and packaging. You really are the connoisseur of colour. I’ve heard of this Cass but never really followed it up. Thanks for showing me the light and writing a great article on this truly amazing story.